A trip to the south of Co. Donegal on a search for Dingy Skippers. 20+ Dingy Skipper, 5 Green-veined White, 1 Large White, 1 Peacock, 1 Tortoiseshell. This area is limestone pavement with grazed Hazel scrub, so there were plenty of plants that I don't find on my local acid soil. The Dingy Skipper - Erynnis tages - is a scarce little butterfly that is very difficult to photograph. They rarely rest, and move at high speed low over the ground and immediately disappear into the background on landing. I lost count of the number of specimens that flew off before I could focus. The specimen in the photograph is a male - it has a pale flap at the leading edge of each wing which it opens to release scent. This is the only Skipper found in Ireland. The Common Milkwort - Polygala vulgaris - is not so intensely coloured as our local Heath Milkworts. There is much discussion in the books about leaf rosettes and so on, but I think the two species are distinguishable on flower shape alone. Compare with the Heath Milkwort from May 11th. 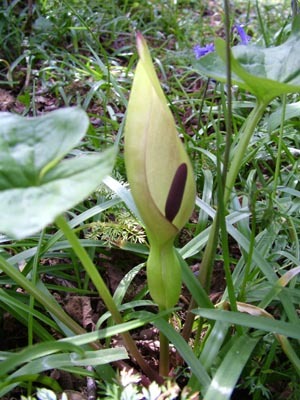 There was enough dappled light in the Hazel wood to illuminate this Cuckoo Pint - Arum maculatum. I haven't found this species locally. These two yellow daisies show up the more lemon-yellow of the Mouse-ear Hawkweed - Pilosella officinarum - on the right. 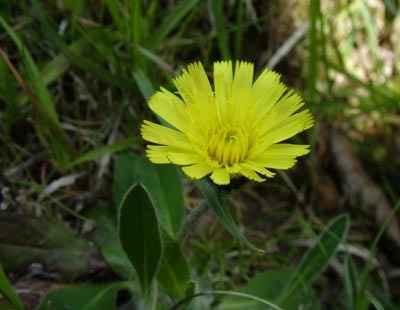 The left-hand specimen is the first Common Catsear - Hypochaeris radicata - of the year. This is the Burnet Companion - Euclidea glyphica -, a moth that looks quite like the Dingy Skipper and can cause confusion when looking for them. These three pictures are of Creeping Willow - Salix repens. This is a truly remarkable plant in that it grows barely above ground level, creeping over the ground at no more than 10 cm high. The pictures show Male catkins, female catkins and seed production. Finally for today, berries of the Juniper - Juniperus communis. The specimens in this area appear to be of the prostrate subspecies 'nana', although that's described as being 'northern'. More tomorrow from this fascinating area.